Das Kaff der guten Hoffnung - Jetzt erst recht! Children love animals, letters, and games involving numbers. With this book, even the youngest children can playfully learn their ABCs, the names of animals, and how to count. 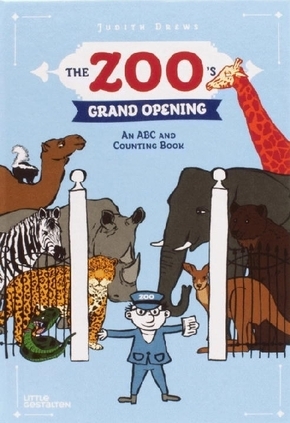 This fun animal book tells the excit- ing story of a zoo preparing for its opening day. The head zookeeper, who guides young readers through its pages, is waiting anxiously for the animals to get there. will they all be in their cages by the time the first visitors arrive? Illustrated with loving attention to detail, The Zoo's Grand Opening is ideal for pre-school children. The book opens on an empty zoo and then follows the arrival of the ani- mals, starting with an anaconda (representing the letter "a" and the number one), followed by a bear ("B" and two) and so on all the way to "Z" and 26. while they enjoy the story, children will playfully be intro- duced to the letters of the alphabet and how to count. at its end, they have not only been introduced to a variety of creatures, but they also know how many animals can be seen at the grand opening. Judith Drews, geb. 1973, studierte Illustration- und Kommunikationsdesign an der HaW Hamburg. Für ihre Illustrationen erhielt sie zahlreiche Stipendien und Auszeichnungen, u. a. den 'Förderpreis für junge Buchgestalter'. Für den renommierten 'Deutschen Designpreis 2010' wurde sie nominiert.